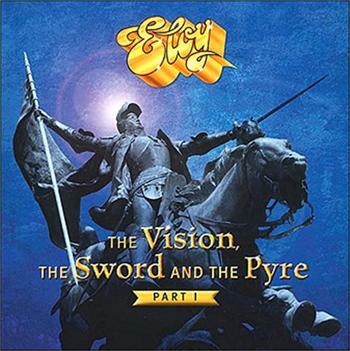 ‘The Vision, The Sword And The Pyre-Part 1’ is the first instalment of an epic project by the pioneering and beloved German Progressive-Rock band ELOY. Composed, directed and produced by Frank Bornemann, the work is dedicated to the life and acts of the late Middle Age French heroine Joan of Arc, canonised in 1920, and combines unique musical complexity with absolute and unbiased historical precision. At the end of the day, no matter the subject matter … it's a new ELOY album, and that’s always a major event at CDS Towers… and it is here now and ready to go for release day!! Having played it from start to finish, I can tell you that ‘The Vision, The Sword And The Pyre-Part 1’ is very much in the vein of the old ELOY we know and love from other concept works like: ‘Silent Cries…’, ‘Planets’ and ‘Time To Turn’, with all the might of the marching choruses, soaring electric guitar solos and glorious keyboard arrangements that are so familiar to the sound of classic ELOY. The core band line-up for ‘The Vision The Sword And The Pyre-Part 1’ is as follows: Frank Bornemann (lead & backing vocals / all guitars / additional keyboards), Hannes Folberth (keyboards), Michael Gerlach (keyboards), Klaus-Peter Matziol (bass) and Kristof Hinz (drums / percussion), with a whole plethora of guests that include or additional keyboard parts, flute, recorder, viola and other strings, plus vocalists, choirs and spoken narrative parts. This epic album production comes in equally epic packaging with a 6-Panel Digi-Pak and accompanying 20-Page Booklet packed full of lyrics, storytelling, credits and other detail. Overall, a fantastic value-for-money ELOY package! If you are one of the few still to be converted to the wonders of ELOY-land, then now is the time to try them out, ELOY are what I would describe as Germany’s Progressive Rock equivalent of the Andrew Jackson ‘Lord Of The Rings’ or ‘Hobbit’ epics of the movie world! Still unsure, then perhaps just go down the cheaper route of getting a flavour of the bands’ music by going for some of the early Harvest (Germany) recordings as listed below… ‘Silent Cries…’, ‘Planets’ and ‘Time To Turn’ are always thoroughly recommended and a great starting point for ELOY! ‘Vision Sword & Pyre-Part 1’ is released on 25th August 2017.